Nick Ritchie scored two goals -- including the game-winner with 1:28 left in the third period -- as the Anaheim Ducks defeated the host Florida Panthers 3-2 on Wednesday night. 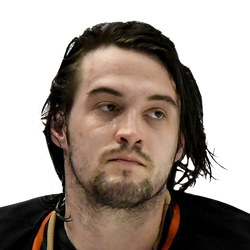 John Gibson made 42 saves to earn the win for Anaheim while Florida goalie James Reimer took the loss, making 22 saves. Josh Manson also scored for Anaheim. Florida received goals from Aaron Ekblad and Evgenii Dadonov. It was the fifth goal this season for Ekblad, passing Keith Yandle for the top spot among Panthers defensemen. For Dadonov, it was his 10th goal, second best on the team. The Panthers, counting Dadonov's goal, have scored on the power play in 13 of their past 14 games. The game was a matchup between two teams with shared history as the Panthers and Ducks entered the NHL as expansion teams in 1993. The Panthers have since won one conference title (1996) and two division titles (2012, 2016). The Ducks have won one Stanley Cup (2007), two conference titles and six division titles. Yandle played his 738th consecutive game, passing Jay Bouwmeester for sole possession of sixth place on the NHL list. Anaheim scored on its first shot of the game, just 15 seconds into the first period. The Ducks won the faceoff and got the puck to Manson, who blasted a shot off of Reimer's glove. Florida tied the score with just 3:01 elapsed in the second period. Panthers captain Aleksander Barkov, operating behind the Ducks' net, found Ekblad in the low slot. Ekblad lifted the puck past Gibson. With 9:16 elapsed in the second period, a tripping penalty on Anaheim's Marcus Pettersson gave the Panthers a power play. Seven seconds later, Dadonov deflected a Jonathan Huberdeau shot past Gibson for a 2-1 Panthers lead. Anaheim closed the second-period scoring three minutes later as Ritchie deflected Pettersson's shot past Reimer's stick. That set the stage for Ritchie's final heroics.